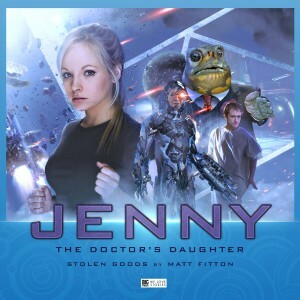 The first of four stories here, Stolen Goods by Matt Fitton, brings back the established Big Finish character of Garundel, a venal and rather camp space frog (played by Stuart Milligan who was President Nixon on screen), who attempts to get the better of Jenny in a complex but well-portrayed insurance scam. The plot doesn't occupy a lot of the hour, which leaves plenty of time for exposition and scene-setting, ending with the introduction of Philips's cyborg bounty hunter. 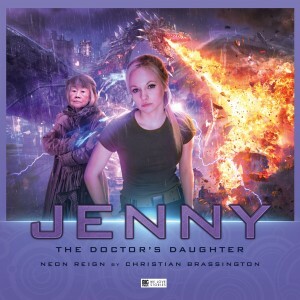 The dialogue sparkles and Jenny is clearly established as a character to look out for. Also glad to hear Clare Corbett, who is a favourite voice actor of mine, though not that impressed that her character is coded as non-white. 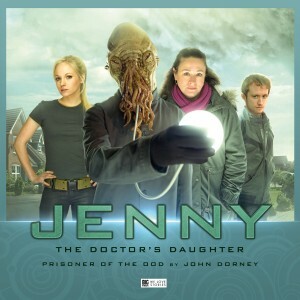 The best of the bunch is the second story, Prisoner of the Ood, by John Dorney (who gives himself a small part as a grumpy writer called John). The narrative jumps forward a bit from the first story, and we gradually find out what happened in the meantime by via flashbacks. 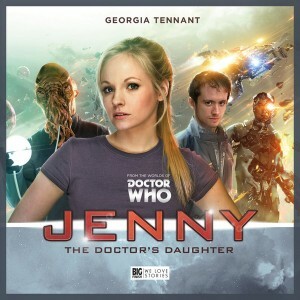 Jenny finds herself in a contemprary English village, and quickly makes friends with newly moved in Angie (played by Arabella Weir, herself a former Doctor); but the Ood, led as on television by Silas Carson, have arrived and only slowly does it become clear who they are looking for. It's played for laughs to a certain extent but is also rather chilling in places. Finally, Zero Space, by Adrian Poynton, takes Jenny and Noah to a place in the universe where there is nothing but a space station inhabited by clones of its two founders, all brilliantly played by Adele Anderson and Anthony Calf (whose first TV role was in The Visitation, where he is killed three minutes into the first episode, and also played Colonel Godsacre in The Empress of Mars). The set-up is very good, and the small cast (joined again by Siân Philips, with a "surprise" cameo at the end from someone else) excellent, but I felt that the script muffed a couple of key points - it's not at all clear why Jenny being threatened with being cloned should be such a big deal; it's treated as if it would be fatal to her; and the ending leaves us with something of a reset button, the mystery of Noah's origins unresolved. It's also unexpectedly short - 45 minutes, whereas the other three are over an hour. The rest of the space is filled with the excellent incidental music of Joe Kraemer. There's a nice behind-the-scenes disc as well. I generally liked this box set, with reservations about the fourth and especially the third installment; I do think it would be pretty acessible to fans of the Tenth Doctor era who had not listened to any other Big Finish, and could even be a gateway drug for them. You can get it here. I have a comment and a question. First, Georgia Tennant's (and Peter Davison's) original last name was Moffett, not Moffatt. Second, how do these stories explain Jenny traveling all over the universe and through time? When we last saw her in the television show, she was in an escape shuttle (not even the original colony ship) in the 61st century. Does she have a TARDIS now, and if so, do they say how she obtained it?